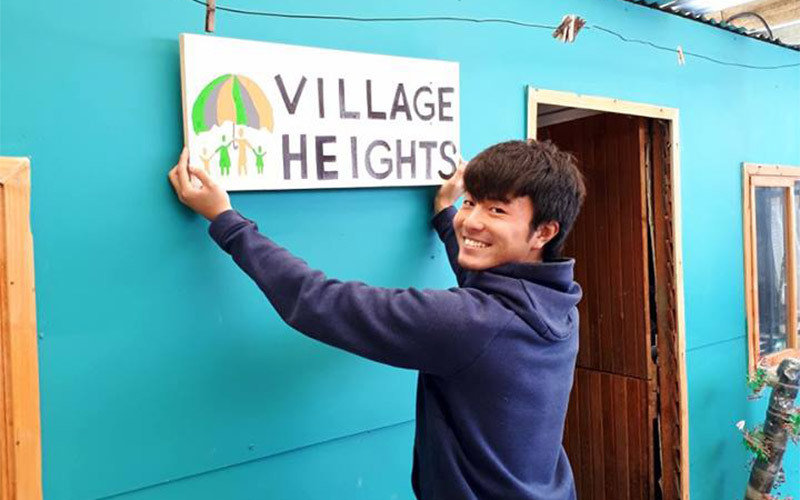 One of ZVT’s active projects, Village Heights Community Centre (VHCC) in an informal area Lavender Hill, also works closely with another organisation, Projects Abroad which brings volunteers from around the world to share their skills and services with this impoverished community. They are currently building a computer and craft –making rooms. ZVT members get to meet a variety of cultures and nationalities – as do the residents of Village Heights – always an enriching experience. In August 2017, three new volunteers put their heads together to work out a way to help the community centre on a long term basis. They came up with the idea of creating a new website for VHCC which will be situated on the Projects Abroad website – but with this link https://katanakah.wixsite.com/villageheights it can be accessed right now. “I am doing Community Township Project in VHCC for 17 weeks. While volunteering, I want to experience another culture and get to know the life stories of people living in a township. My goal is to help the people, especially the children in need and bring them closer together. I want them to take a break from their daily problems and have a good time with each other. Every time I make a child smile I know why I am here. I want to make a change in the way people see each other, with the goal that they understand that they should not turn against each other, but live together in peace. Most people think they are on their own, but in the Centre we try to change their way they see their lives and we support them in every action towards a better life. With the privilege of coming from a first world country, I want them to feel that they can achieve everything they want if they have the right motivation. They should know that we are there to help and support them. I am open to answer every question and I am willing to help. The world cannot be changed in one day, but little by little we can all work together towards a better tomorrow. I decided to volunteer with Projects Abroad in Cape Town. I was motivated by a desire to use the skills I had acquired during my studies, to benefit, and hopefully assist people in desperate circumstances. During my placement in Village Heights Community Centre, I have had the privilege of working with a vast array of people, from all walks of life, who all have as a common goal the desire to help others. I have been involved in an array of projects, from running legal clinics for the people of Village Heights, to assisting with soup kitchens, and planning how the resources at the Community Centre can best be used. This has been an immensely rewarding experience. As I prepare to return to the UK, I believe my time spent here has a huge impact on me as and I will leave Cape Town determined to continue making a small difference in some of the world’s poorest communities, wherever they may be. For this reason, I will be undertaking a Masters Degree in Disaster and Crisis Management over the next year, following which I hope to secure a job with an international charity or NGO. It is my hope that this will lead to a career, which like Village Heights Community Centre, is focused upon helping others. I’m working as a volunteer of Projects Abroad in VHCC and I will stay here for 3 months. Before, I had been helping refugees who had been escaping from Libya by ship in Italy for 2 months. The reason for my decision is to see the situation about refugees, immigrants around the world and I’m thinking that I ‘d like to make refugee people’s dreams come true in the future. Therefore, I’m taking leave from my university for 1 year so that I can use of these activities in my major (Diplomacy) when I go back to Japan. My work is to make a new website of Village Heights and hold basic business class (Excel, Word, Power Point, Typing) and with some local people make a soccer team of kids and design interior of Village Heights. When I came here first time, I was surprised by the gap between poor and rich in this city. I didn’t know what to do but I have understood my role as I get used to it. I am gradually pleased to finish up little by little by doing what I can do. It was really good experience for me through these activities.